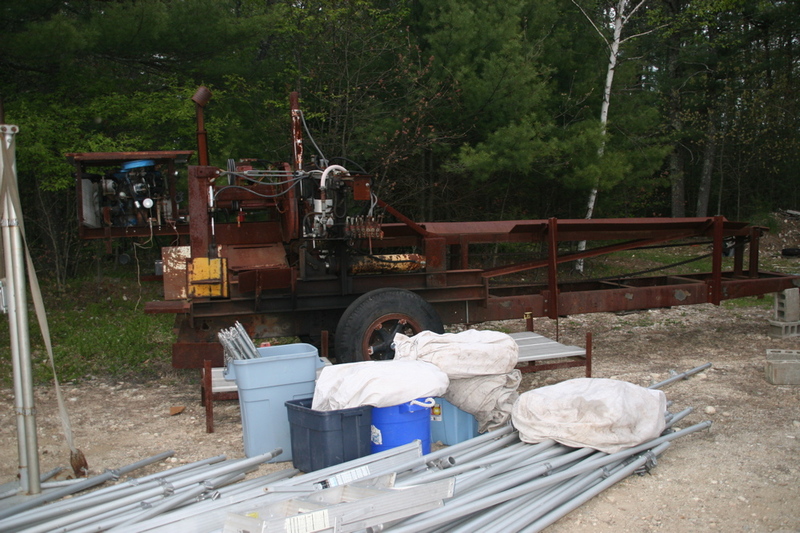 Hauled this in from Brookline, NH. Seemed like a good idea at the time, and most of the parts were there to get something up and running. The original layout for product flow was actually quite good. The balance of the unit, with the engine mounted high and back, makes for a fun time on the road. At some point the powertrain will be relocated to under the infeed conveyor. My goal was to first get it running, and then figure out what worked, and what did not. 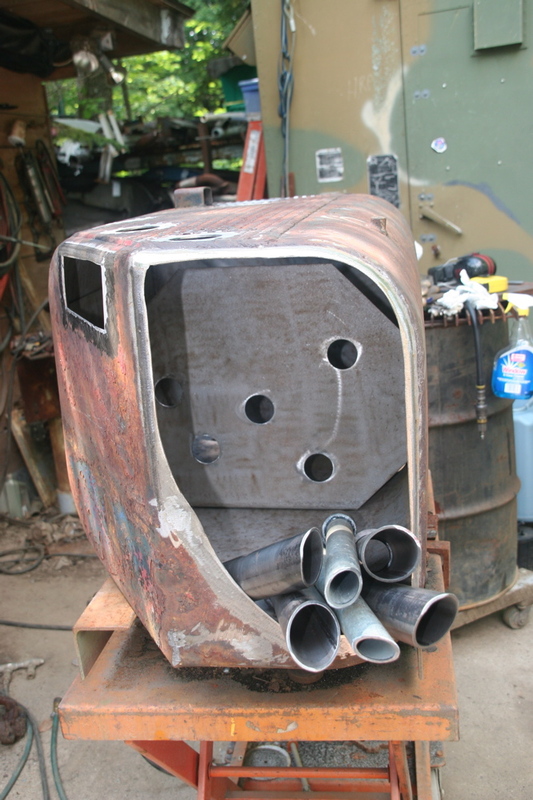 As such, I did not drastically reconfigure the sub assemblies, but rather improved upon, or replaced as necessary. If/when I built one entirely from scratch, many changes will be made. The reservoirs are too small. The silver tank was later modified and installed on my small splitter. I think the builder intended for the saw to be driven directly by the line shaft. It appears there may have been too much drag for the starter motor, so that plan was dropped in favor of hydraulic drive. 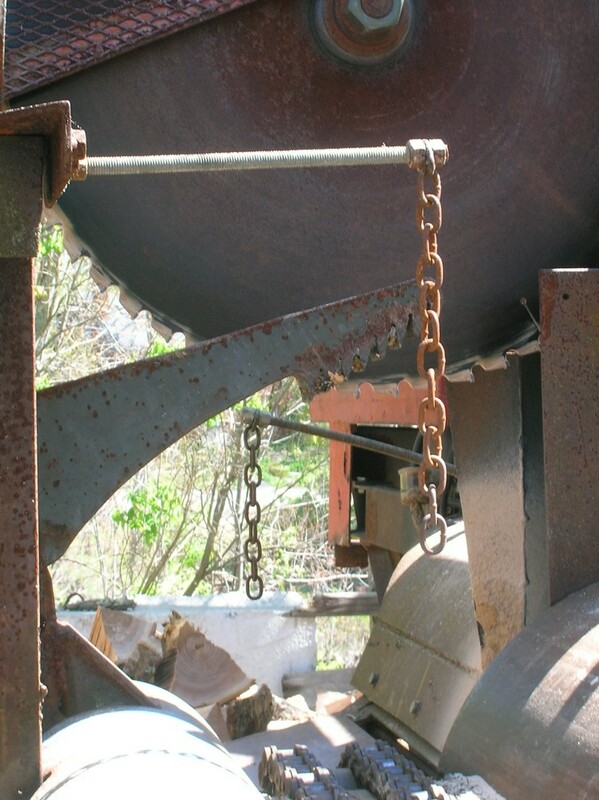 The saw carriage pivots on the line shaft. It bounced quite a bit when the shaft got up to speed. 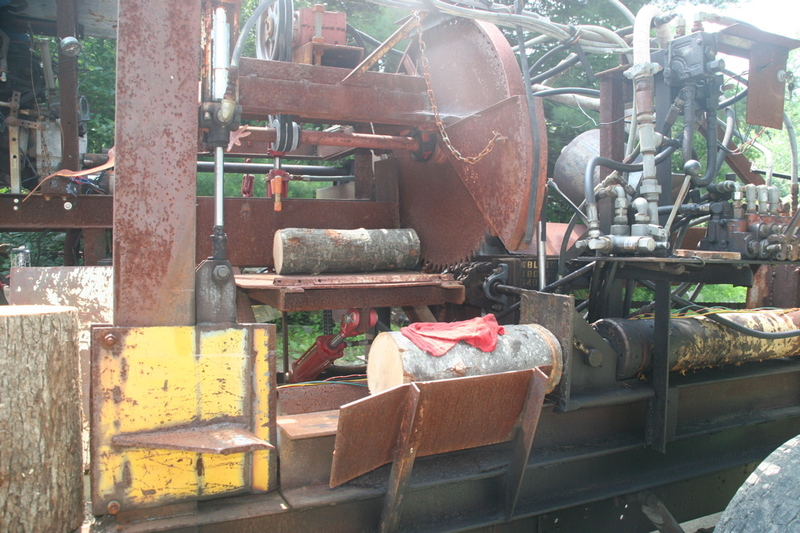 View of the original log clamp. This employed two cylinders, and while it did hold the log, it was dog slow, if you will pardon the pun. With all that rusty metal, and that Corvette side pipe sticking way up in the air, I thought I was towing a prop from Beyond Thunderdome. 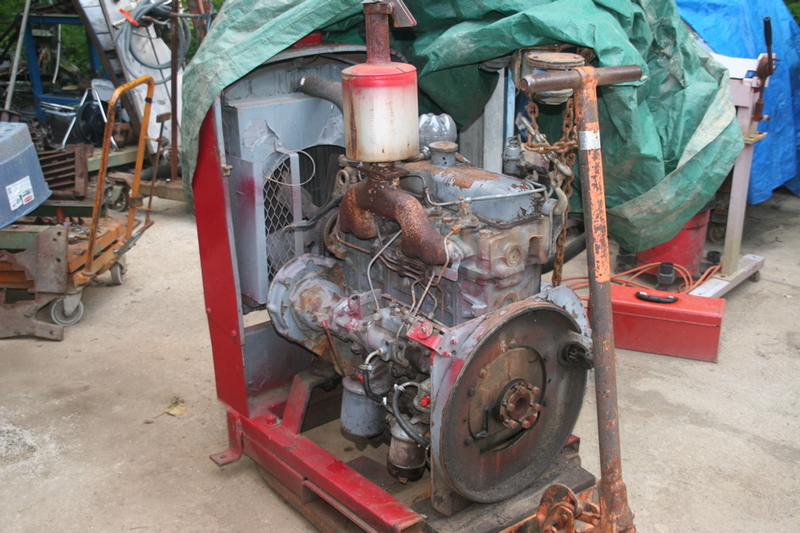 The engine did not run, as the electric fuel pump was dead, and the carburetor was full of junk. 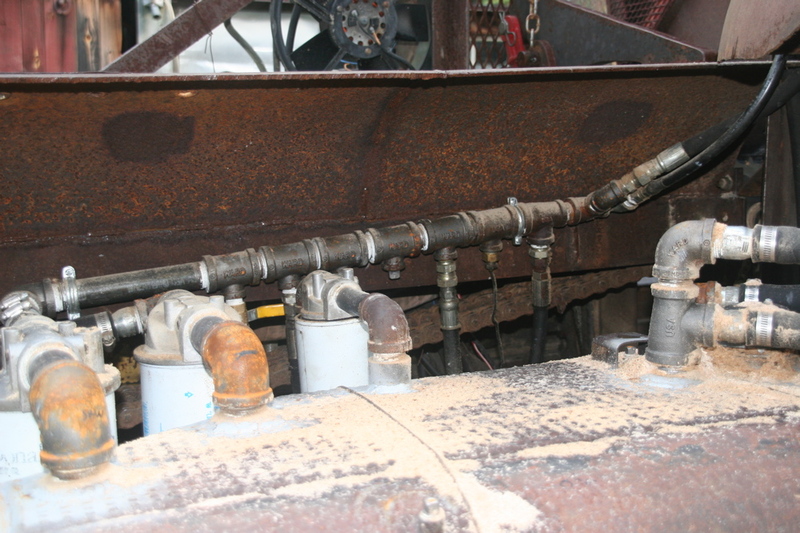 Once that was resolved, I set about cleaning up the mess of hydraulic lines. 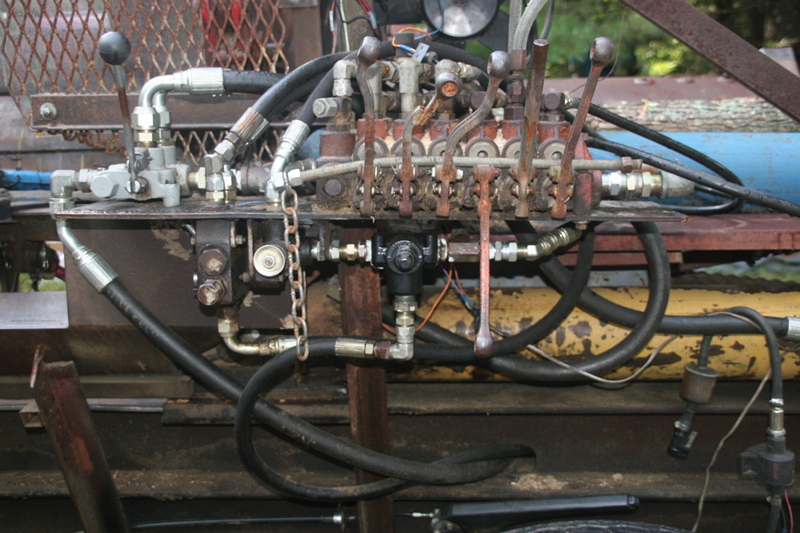 The saw and splitter circuit used the same pump, which entailed shutting off the saw with a selector valve to split, and vice versa. A dull maul and hand saw were faster, so a third pump was needed. 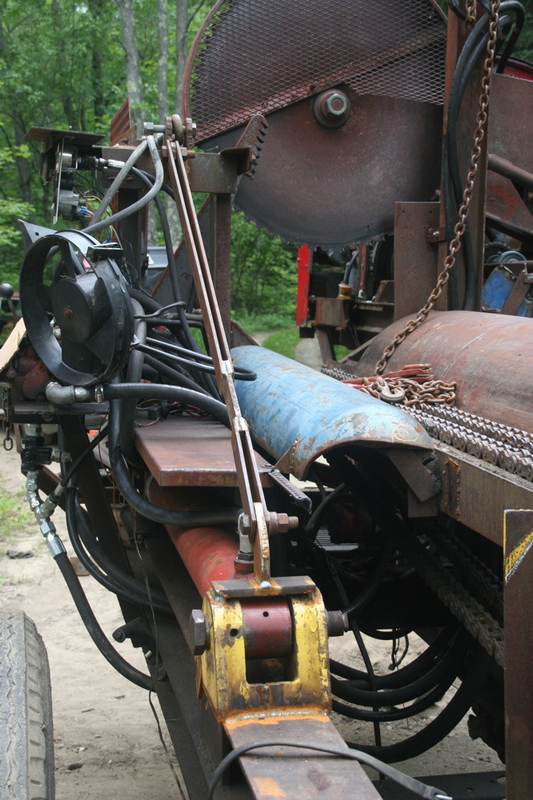 I wanted to drive it off the end of the line shaft, so the tanks needed to go. 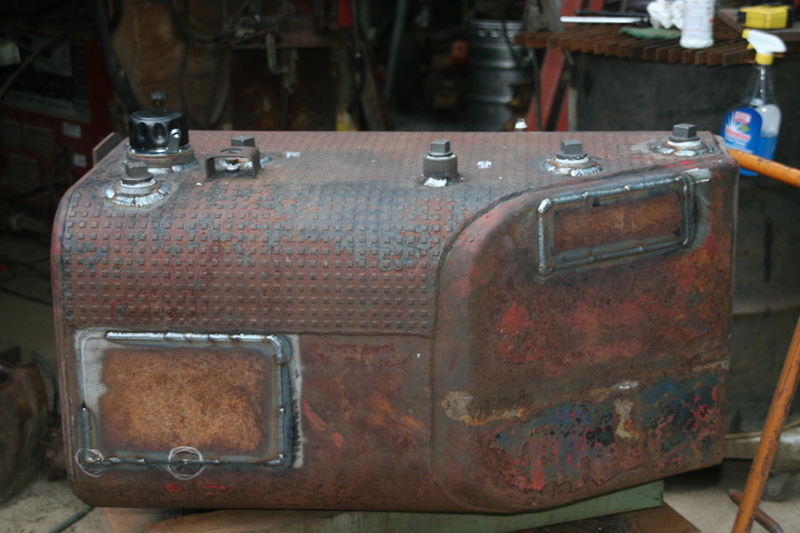 At the time, my knowledge of hydraulic systems and their requirements was quite rudimentary, so I had no reason to believe that an old SAAB fuel tank would not make a good reservoir. In retrospect, this was obviously a waste of time, as it was way too small, and the metal too thin to handle the vibrations. Money and time wasted, lesson learned. I still have all of my digits, so no big deal. Test run. How about something easy, like a dessicated piece of maple. Blade appears to be dull. Hmm. Way too slow, but at least the parts move around. 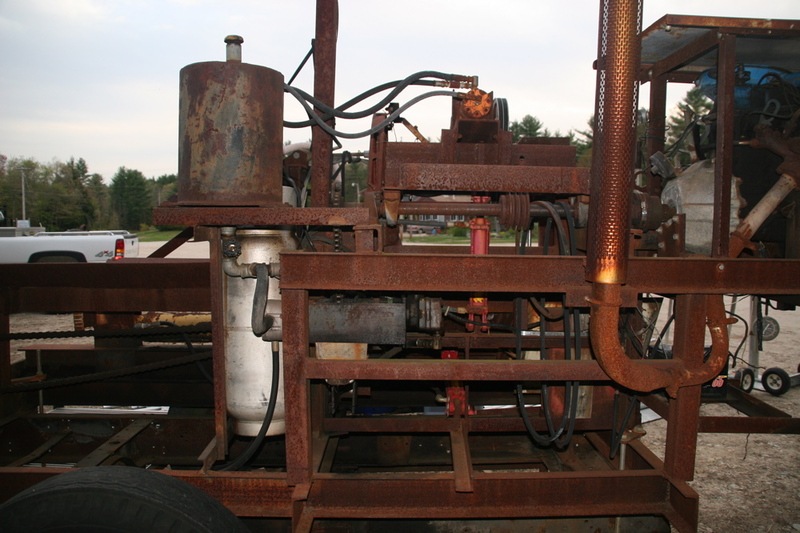 Shortly thereafter, the pump for the controls, conveyor etc went belly up. 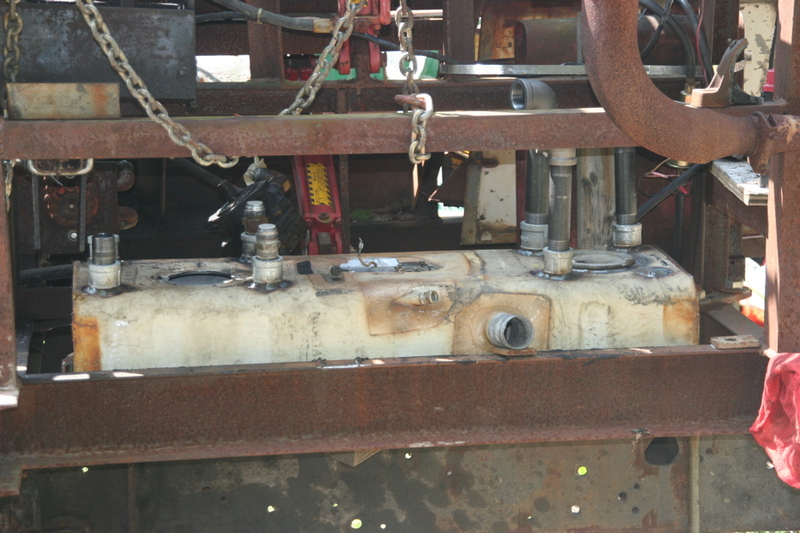 The main valve stack was configured for a closed center system, so that probably didn’t help, despite one work port venting back to the tank. 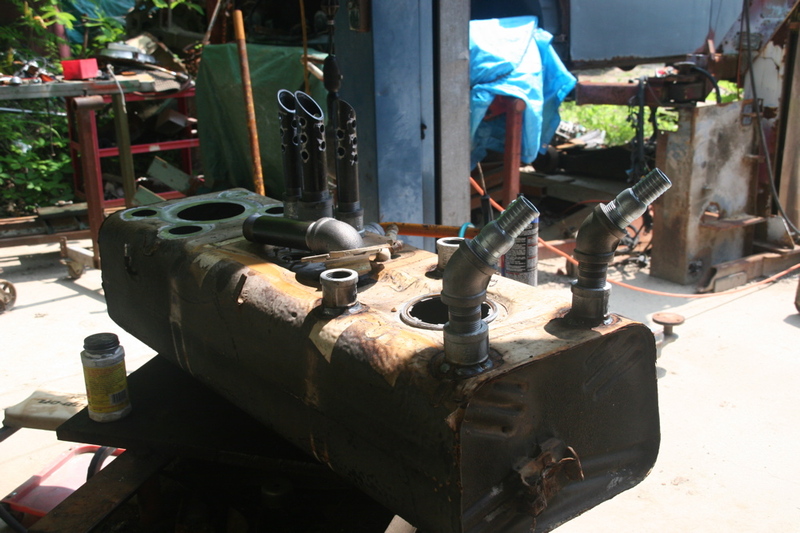 My neighbor was kind enough to donate an identical Vickers pump from a Ford 8n. 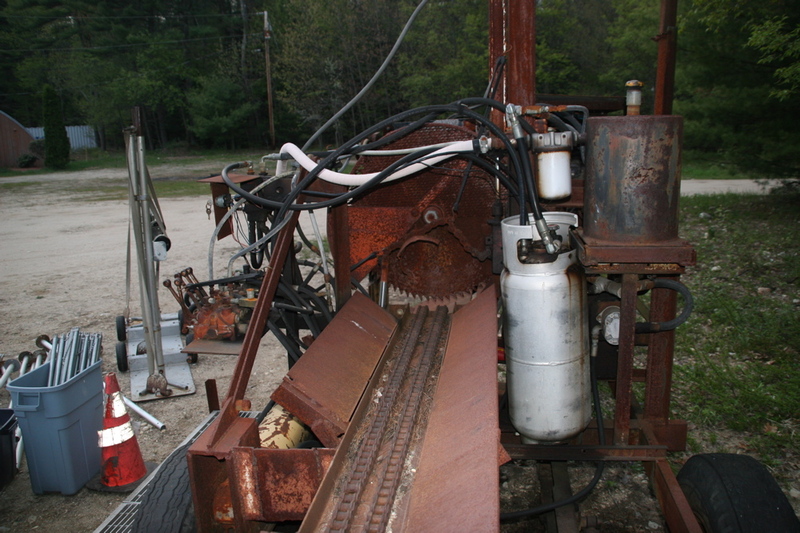 As noted earlier, the saw carriage was a bit flimsy. 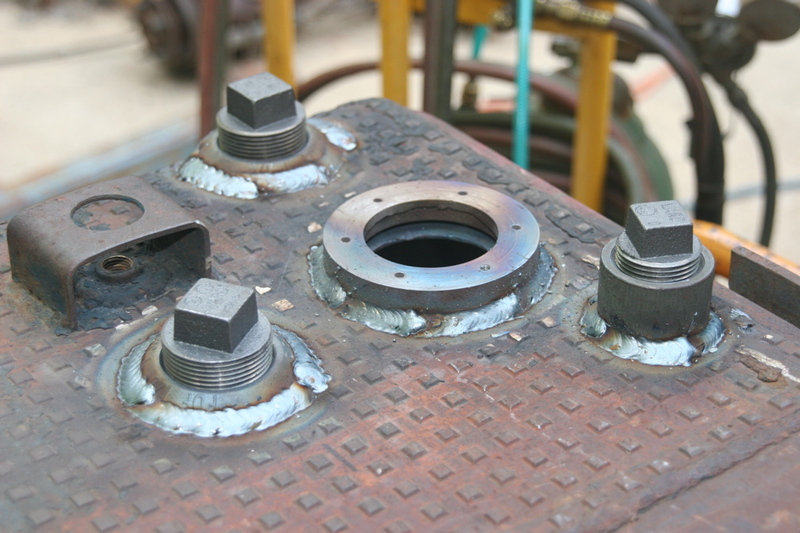 With the mangy Babbit removed, these bearing supports took a standard set of shell inserts from MSC Industrial Supply. 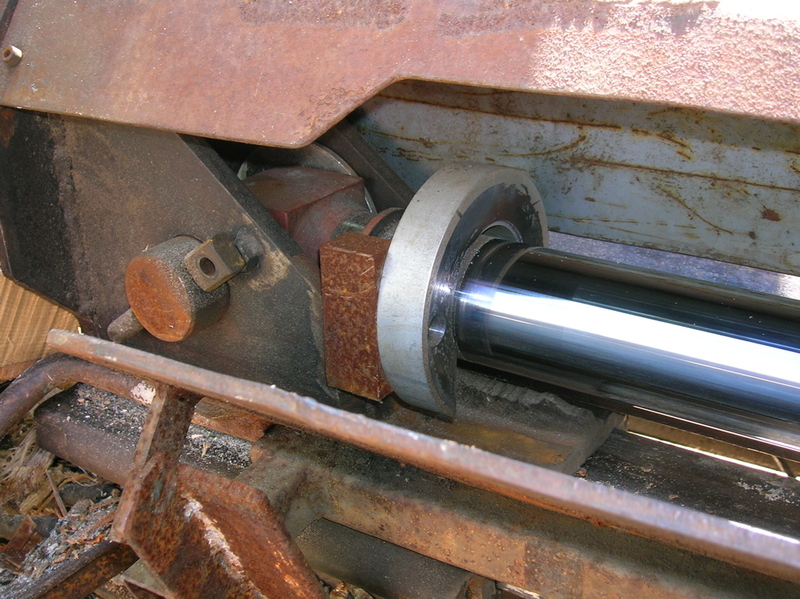 2.5″ bar stock for a hinge. 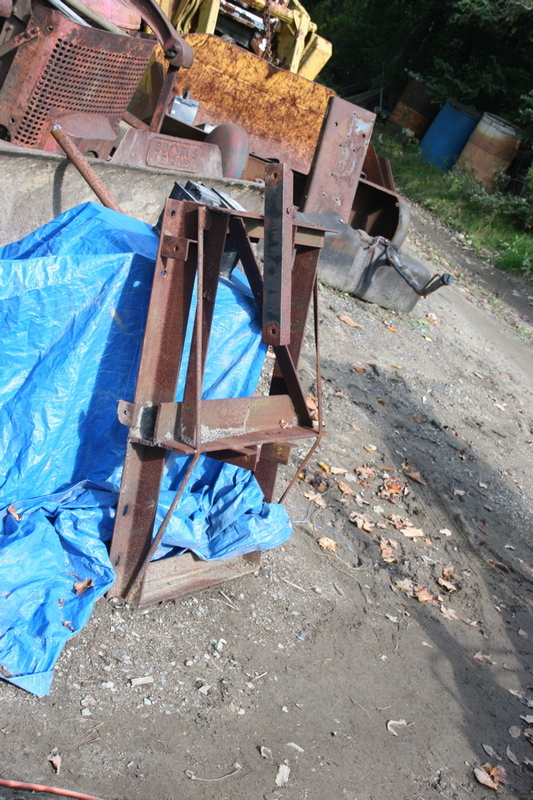 The plate steel came from some bizarro farm tractor implement of unknown manufacture. Bracing an orthodontist could be proud of. Now that looks a bit ‘safer’. With the blade professionally sharpened by an artisan, the wood moves along. Shortly after this photo, I pulled the wrong lever at the wrong time and pushed the blade guard into the blade with the flip table. 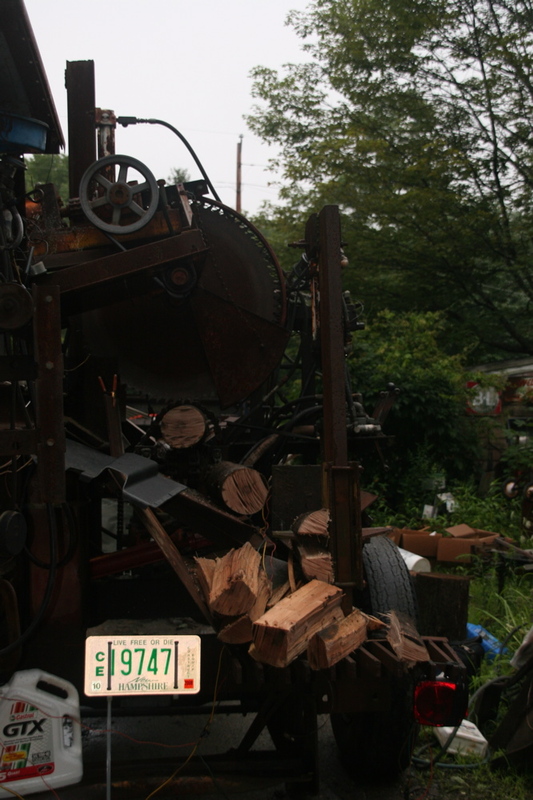 With chagrin I returned to the saw filer for another go ’round with the setting block and file. 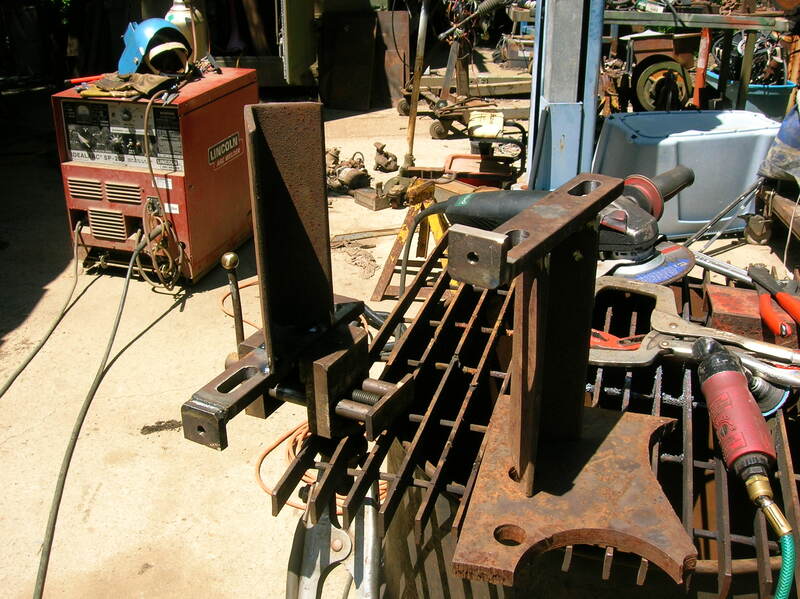 Hinge pivot pedestals. 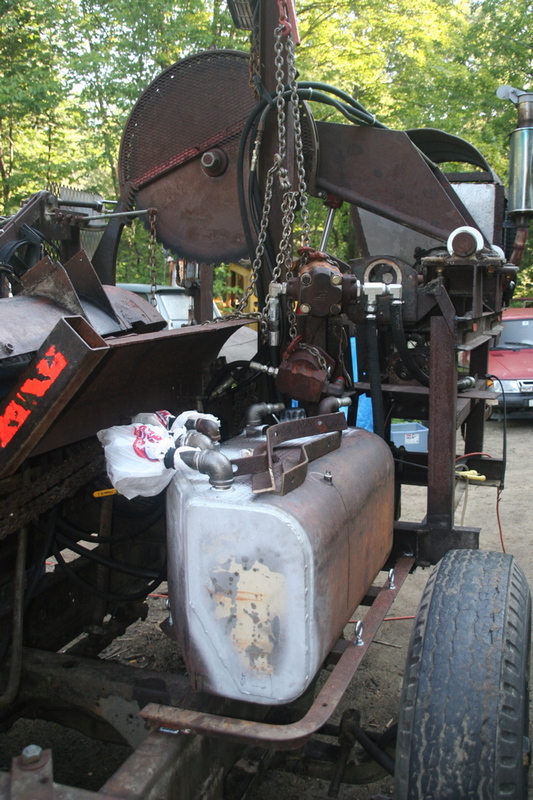 Driveline cover made out of an old air compressor tank. 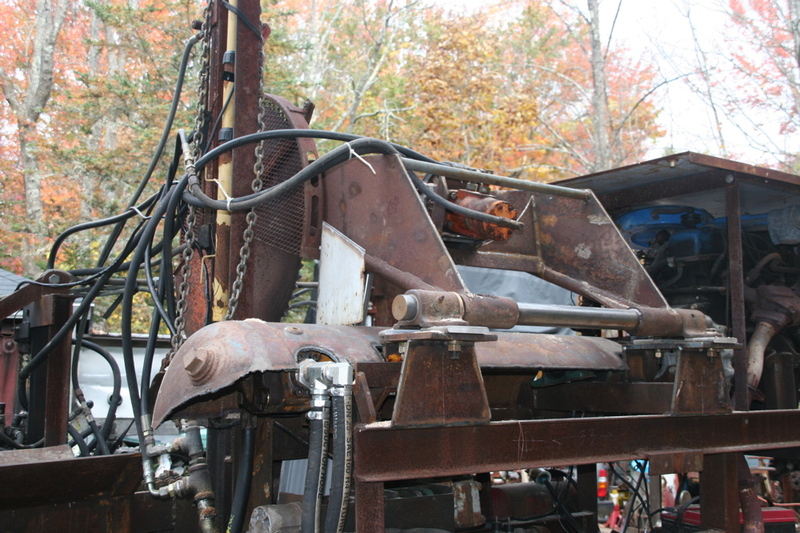 Large pump on the end of the lineshaft is the front section from a Case excavator. 42 gpm @2200? A four way wedge? Seriously? That’s more like it. 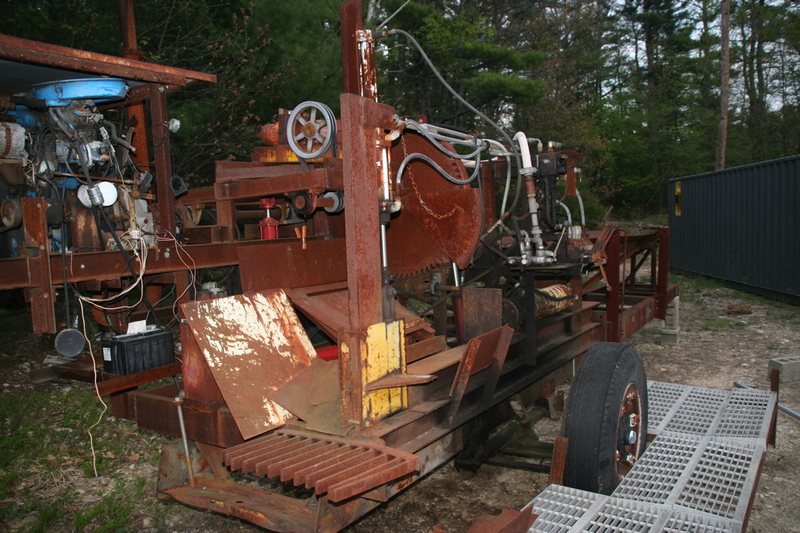 Given that the maximum log diameter is 13″, splitting either 2 or 6 way provides an idea block size for our own Tarm furnace, as well as for those I sell to. At first I thought the diameter limit would be an annoyance, but the primary advantage is no re-splitting. 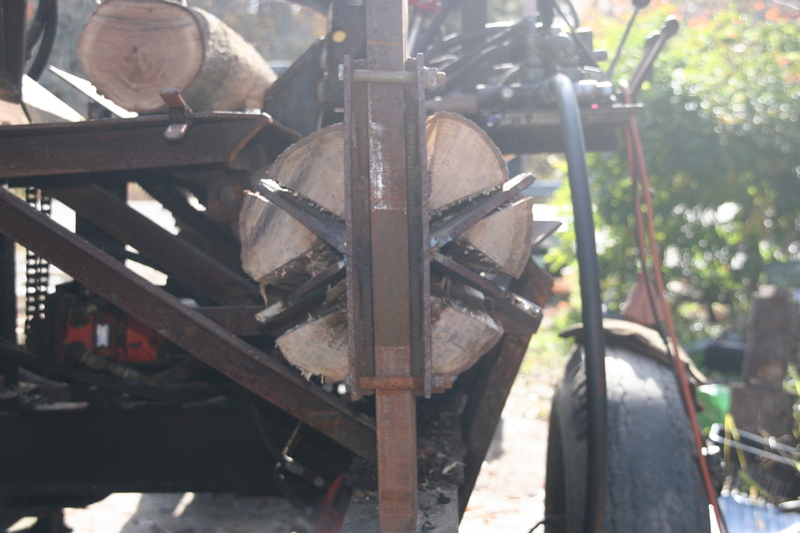 Anything larger goes through the chainsaw/manual splitter. Looks like I dulled the blade again. 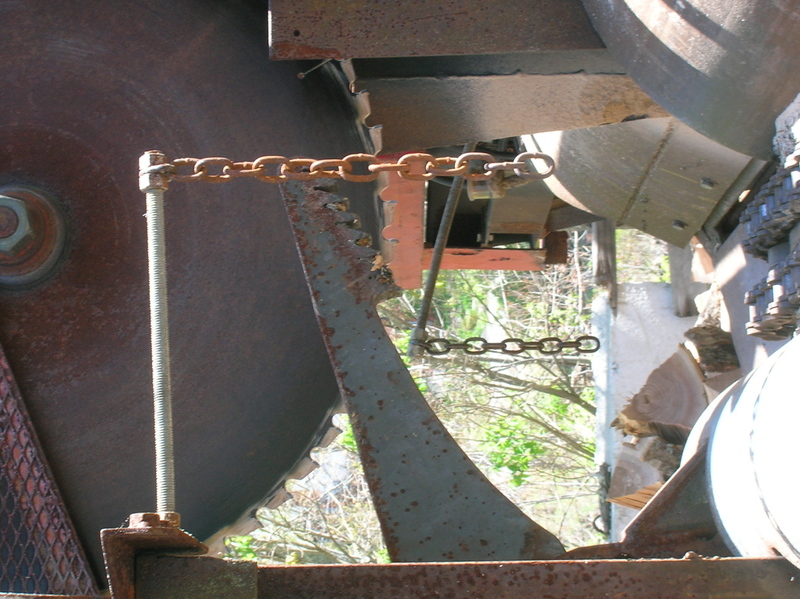 Dangle chains for block length. These can be moved forward and back in two inch increments from 14 to 20 inches. 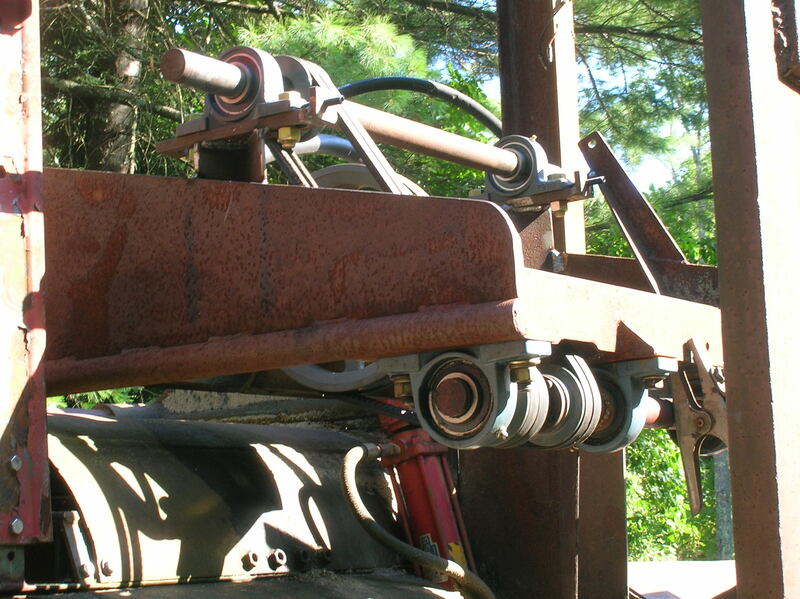 At some point I would like to add a positive plate stop on a hydraulic ram. As the machine gets ever faster, this is one more area to pick up a few seconds per cycle. Still slow going, but faster than manual labor. The blast shield is on the upgrade list. 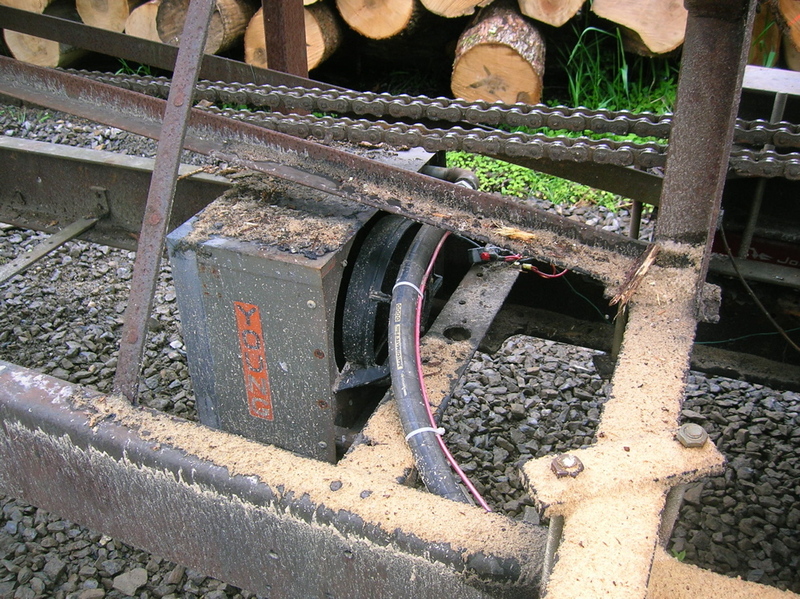 I had around 12 cord of salvaged skidder bridge wood to process, and while a circle saw is more tolerant of dirt than saw chain, this was more like a crust. Time for a carbide tooth slasher. As it happened, BH Payne was running a special on blades, so I was able to purchase a 30″ blade for right around $300, including shipping. This is what disappointment looks like. A few teeth short of a vampire flick. Now to work up a shipping claim and a return authorization number. A 12 gallon reservoir just doesn’t cut it when you’re pumping around 50-60 gpm. I could work for about half an hour before the oil temperature went over 160 degrees. I need a bigger tank. 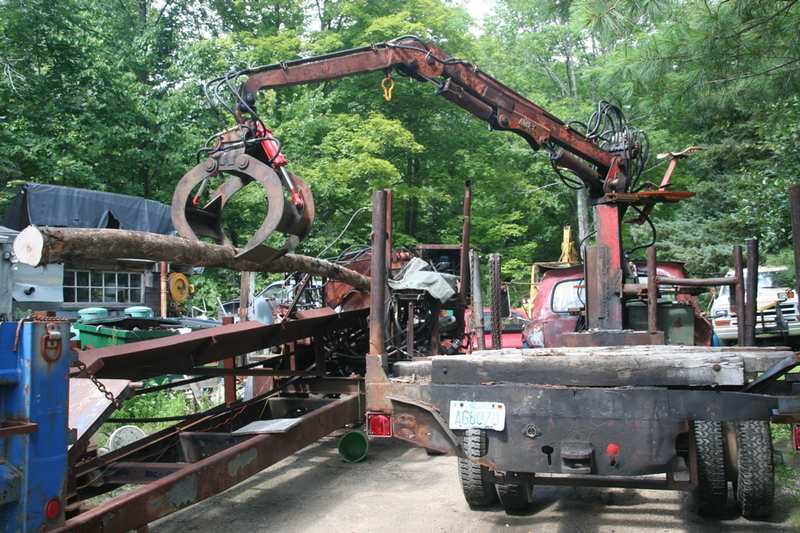 A local logger donated his long-retired transfer tank. We found it under a tree. In a previous life this was a fuel tank from a road tractor of some sort. Cut a few holes in the side, spend a few days with the spot blaster cleaning out the inside, and another chunk of scrap becomes useful. Suction and the fill ports on the near end, return on the far end. Closing up the entry wounds. 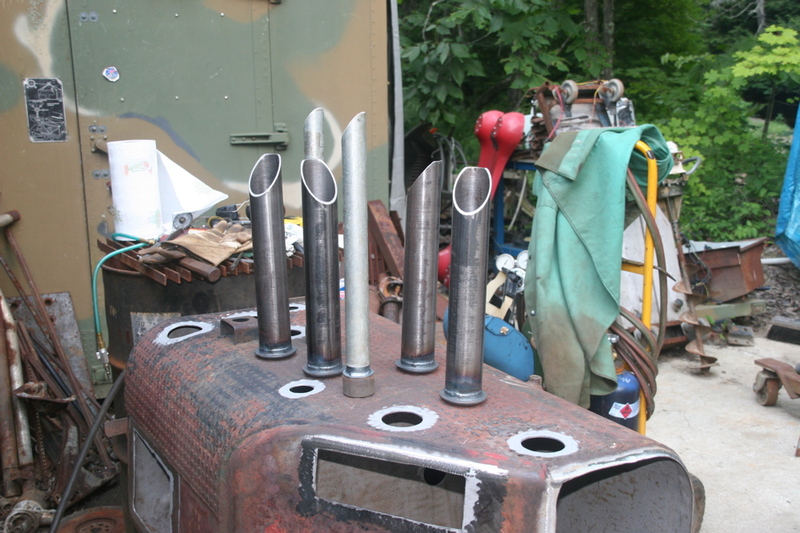 Soapstone (lower left) marks the sketchy part of the weld. Goodbye to this tangled mess. 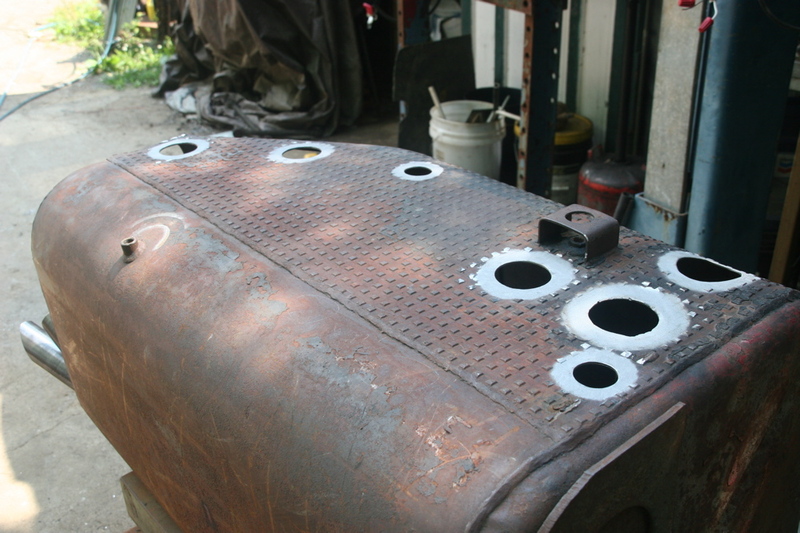 The angle on the tank provides just enough room for the filters, mounted to the inside for protection. View with new sawdust chute. With a gimpy hand pump, the 45 gallon fill felt more like 70. …and then the motor stopped. Looked, at first, like a broken timing belt. On a Friday afternoon, no less. 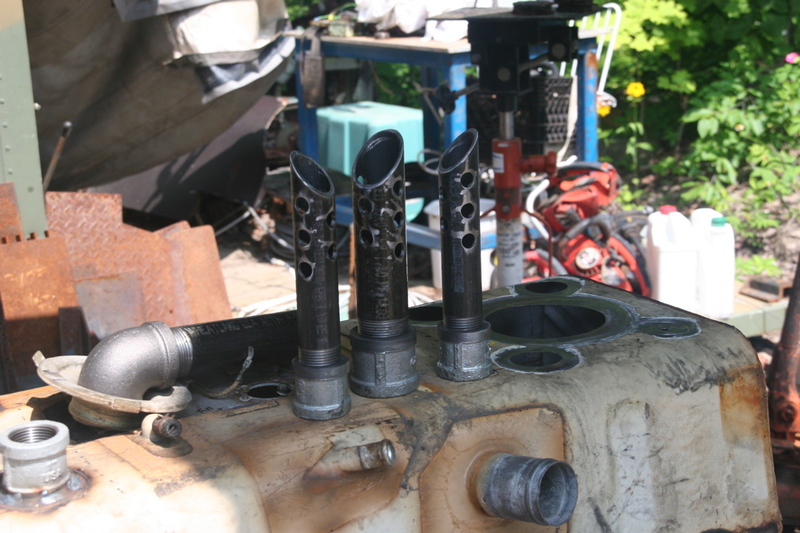 …The camshaft seized due to a loss of oil to the top end. 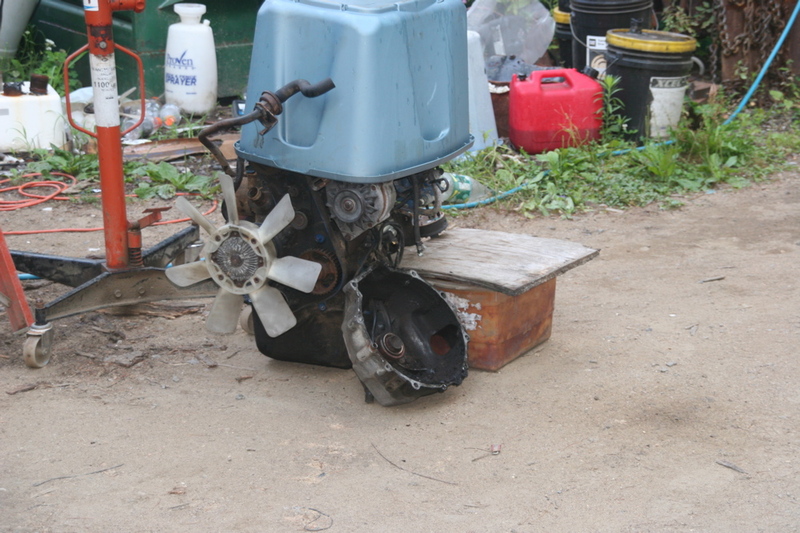 This motor is now junk. All to the good. I didn’t like it anyway. The pressure relief in the saw circuit flow control was blowing off at 1500psi, and the saw motor was rated for at least 2500 continuous. When I locked out the original relief, and replaced it with this remote unit, the saw was taking a bigger bite, and the motor didn’t really care for that. Clear off the flight deck for the new mill. 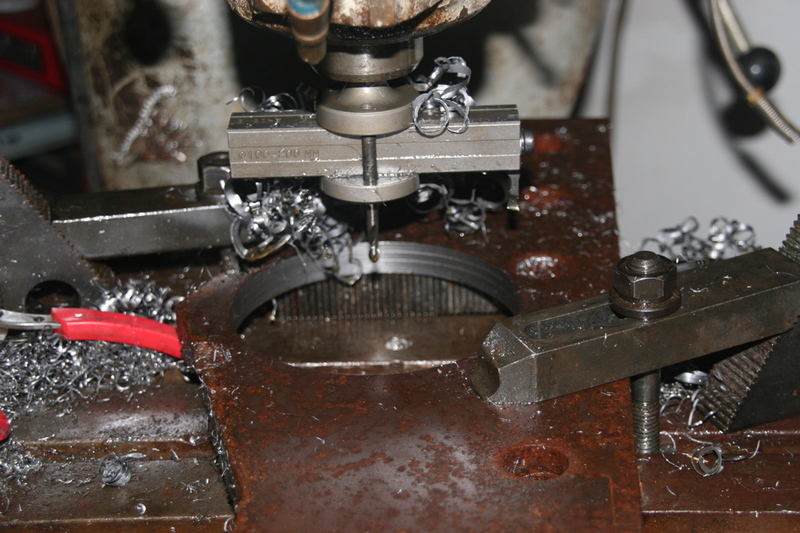 Speaking of which, using the Bridgeport to cut a slug from plate stock to make the drive hub. 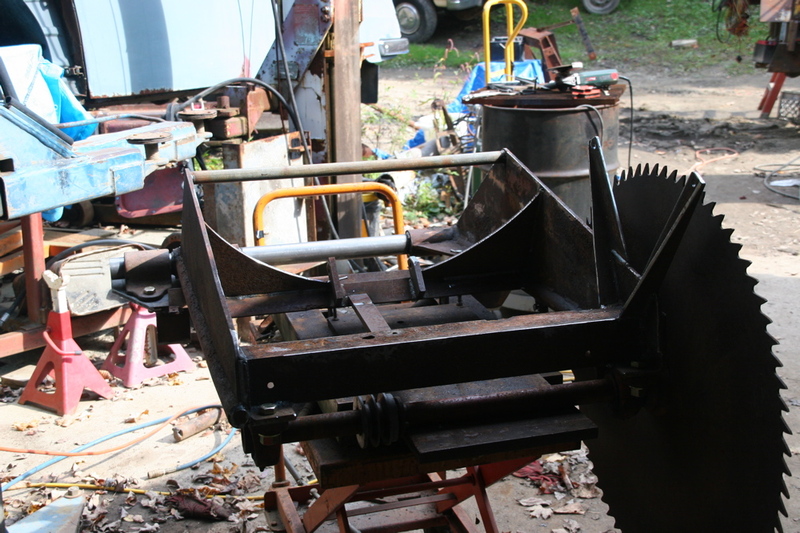 On to the Warner Swasey #3 for boring and facing. Photo op with industry rag for authenticity. The Bedford is clearly better suited to the task. 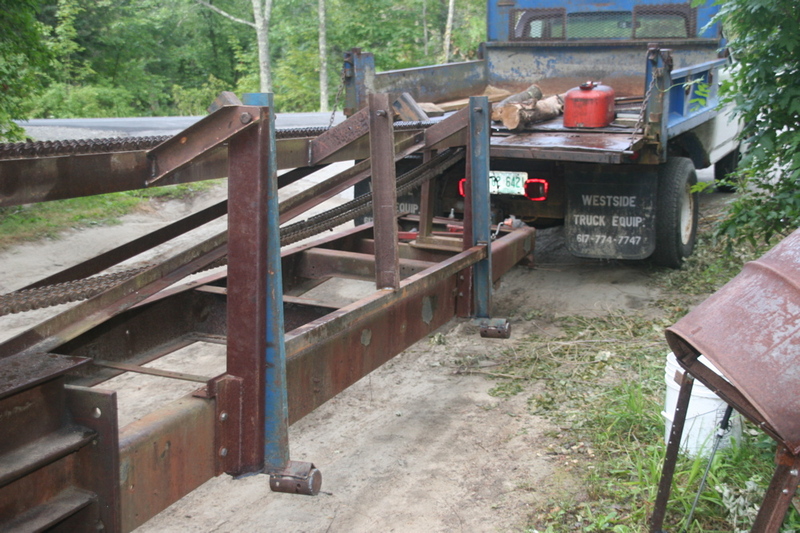 While it was in for the engine swap, I built a small cold deck on the operators side. Here it is in the ‘travel’ position. The addition of a rail to the far side permits log rolling with abandon. 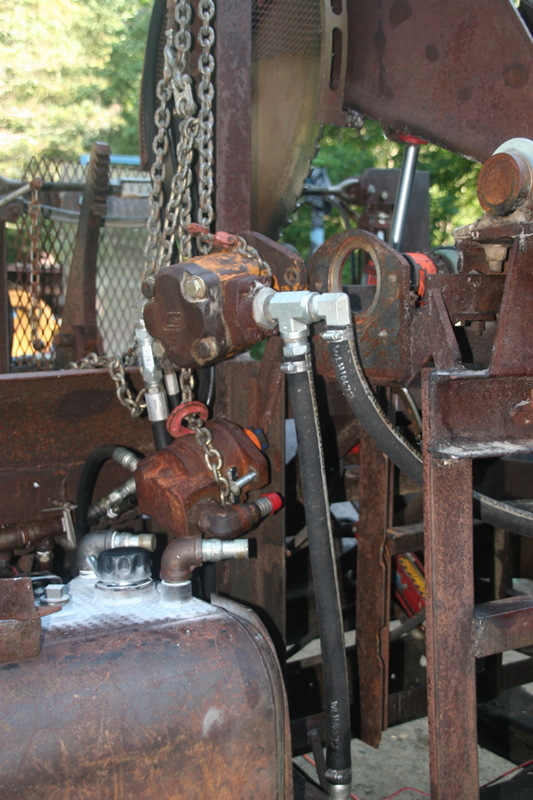 With the powerplant upgrade, and control of pressure loss on the saw circuit, the weak link in the driveline is the chain drive to the drop box for the saw motor. It turned blue from the heat. Then it stretched, and eventually broke. This gets old after awhile…. A serious reconfiguration is in order. If the current saw motor is driven separately from the conveyor/clamp/etc circuit, the drive ratio can be changed to raise the pump output. 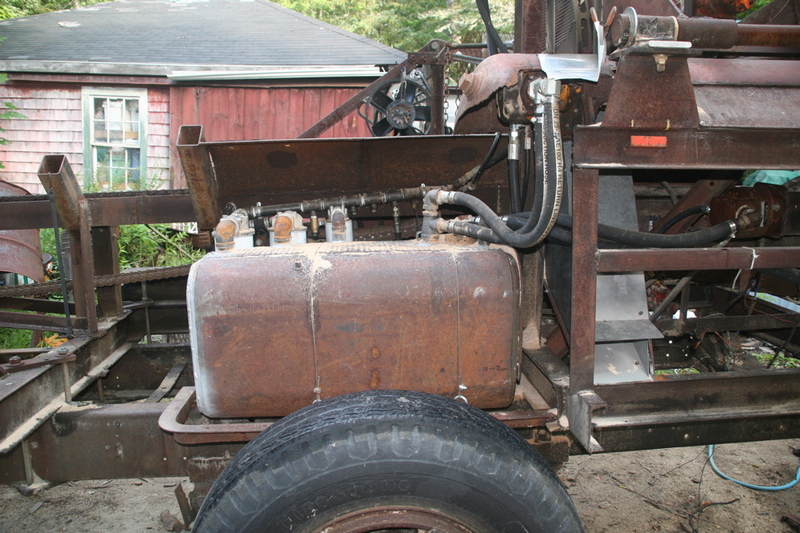 That pump can then drive the splitting ram. 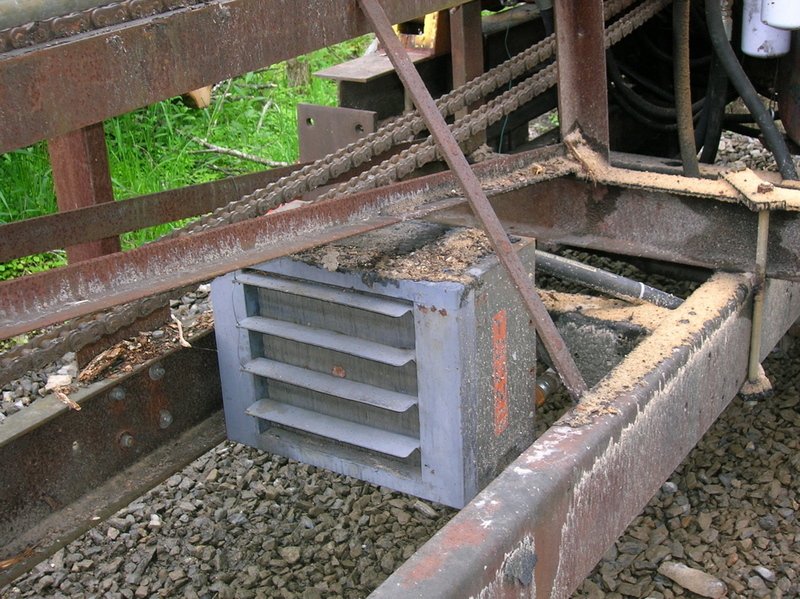 The loads on the splitter circuit are transient, whereas the saw circuit is under heavy load while in the cut. 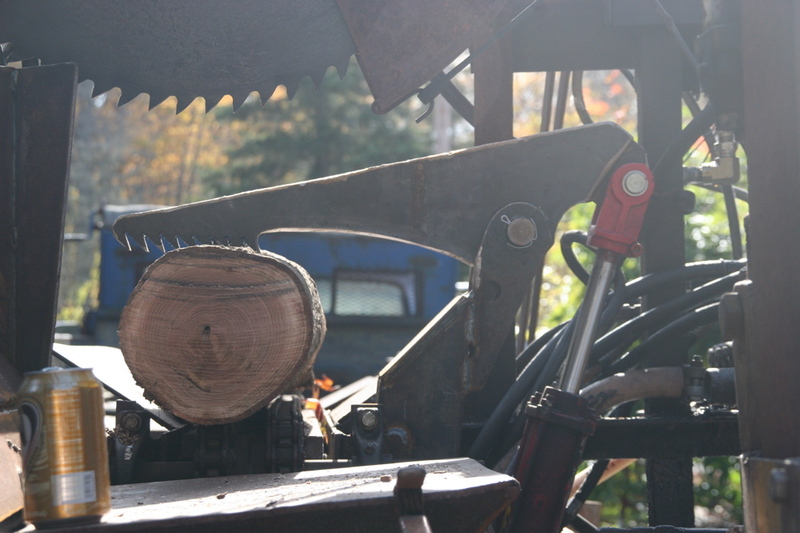 The splitter pump can then run the saw, and as that pump runs off the end of the lineshaft, the only weak link is the oversized Lovejoy. Added a center bearing to reduce shaft flex. 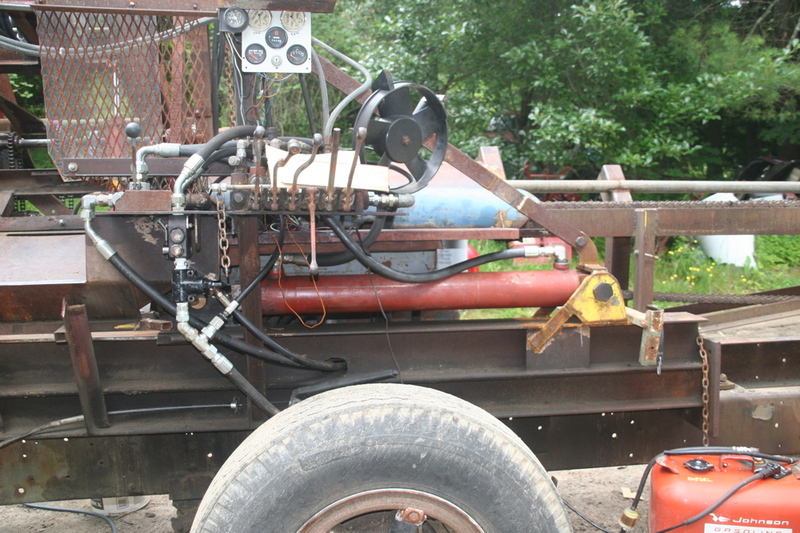 The splitter ram bore is nearly 6″, and it is already too slow, even with the big pump. 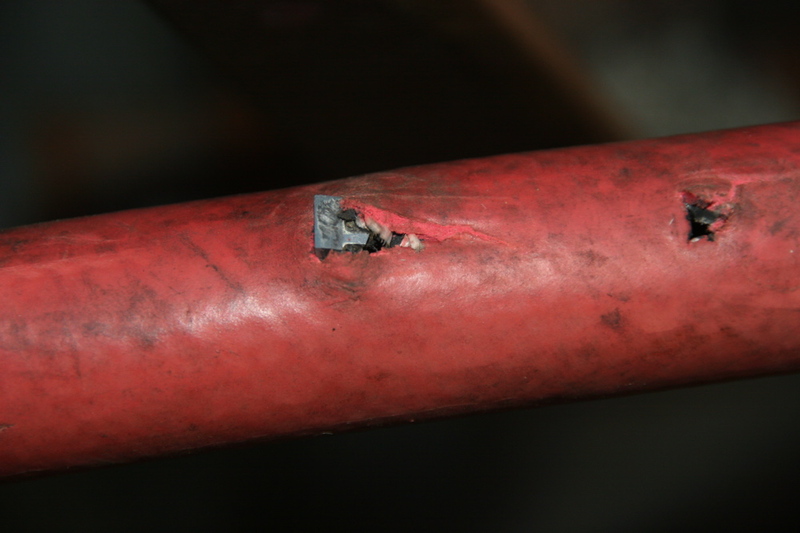 With gauges on each circuit, the splitter never saw more than 800 psi line pressure. 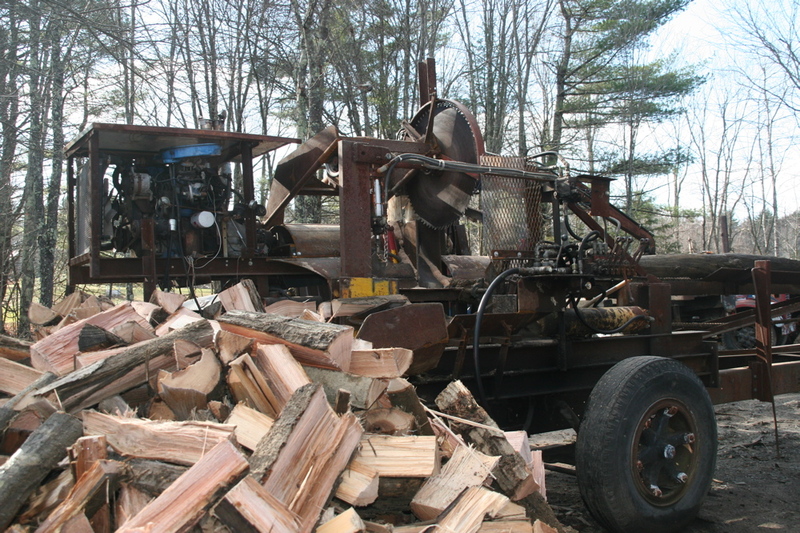 Some of this is due to log selection, but in reality it doesn’t take that much to split most of the wood that will fit the machine. So I need a different ram. 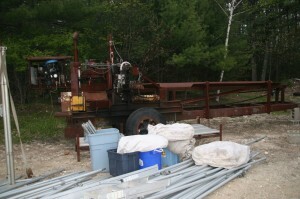 Surplus Center had a ram with a 4″ bore and 3.5″ rod. Stroke was a little long, but I made a stop collar to bolt on the back of the pusher sled. The boat tank is the ‘temporary’ fuel supply. 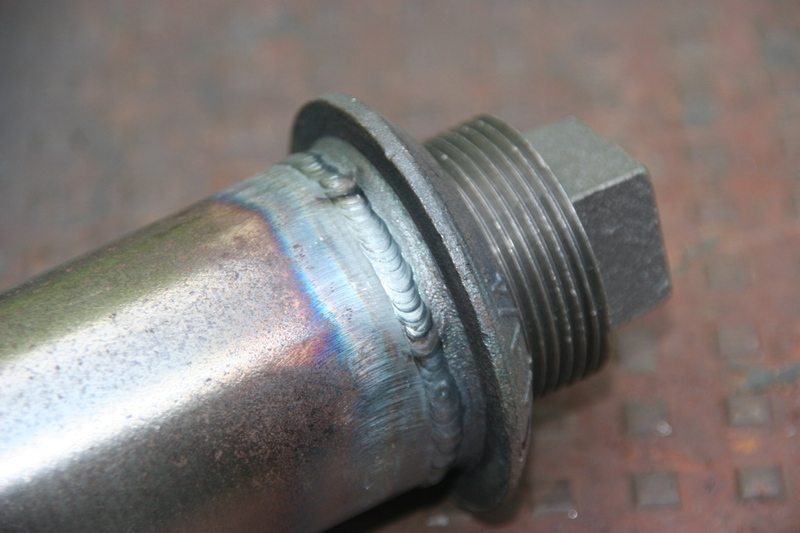 I brazed another fitting to the tank for the injection return. Another bonus is the port size. SAE 16, if memory serves. The blue metal is half of an old oxygen cylinder. 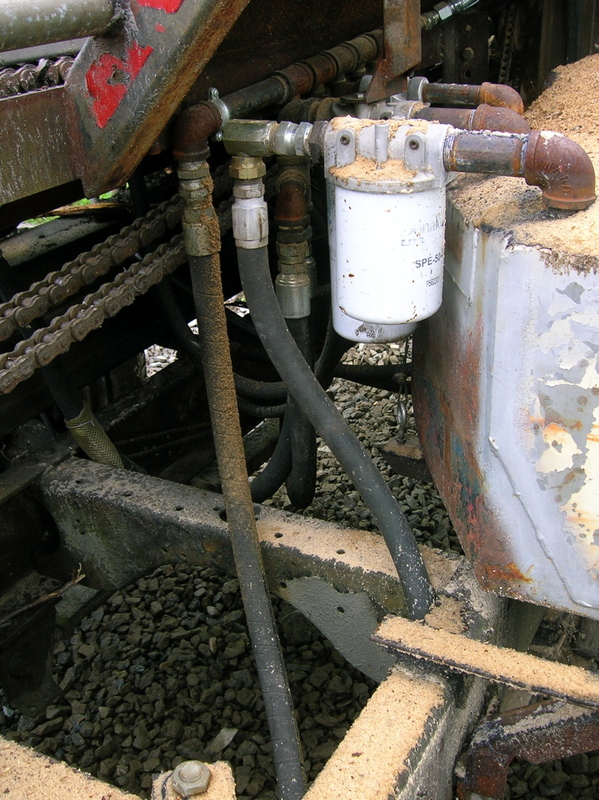 That and another section of air compressor tank form the infeed trough. 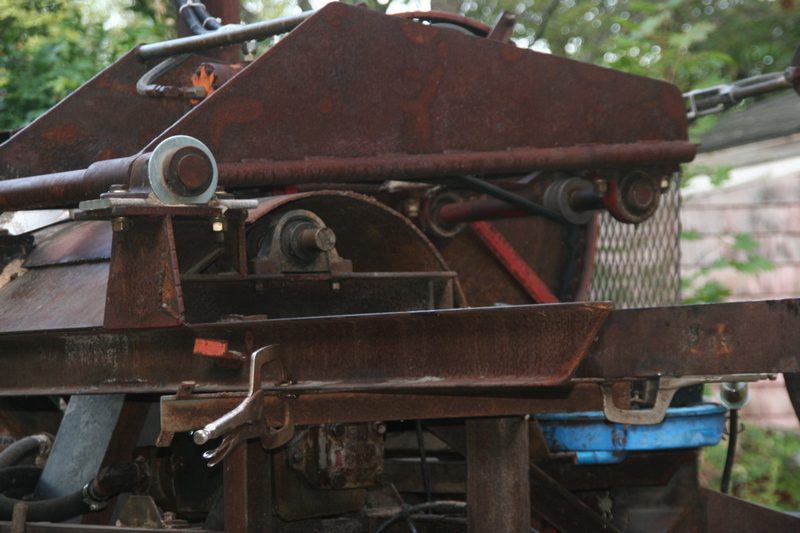 The plate to the left of the pusher keeps the blocks from getting stuck as they roll into the trough when the pusher has not fully retracted. 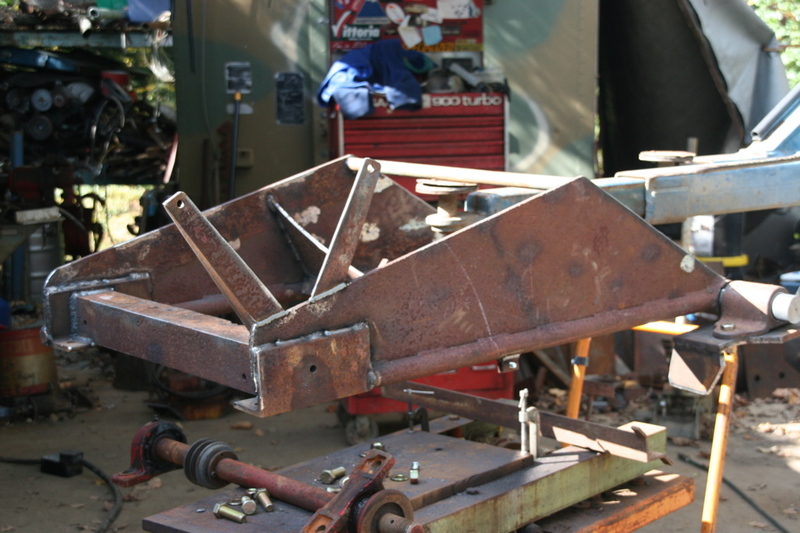 In the shadows can be seen the rod cover bolted to the pusher, and under that the faint shine of the aluminum bumper at the back of the pusher sled. Now we’re cooking with gas. 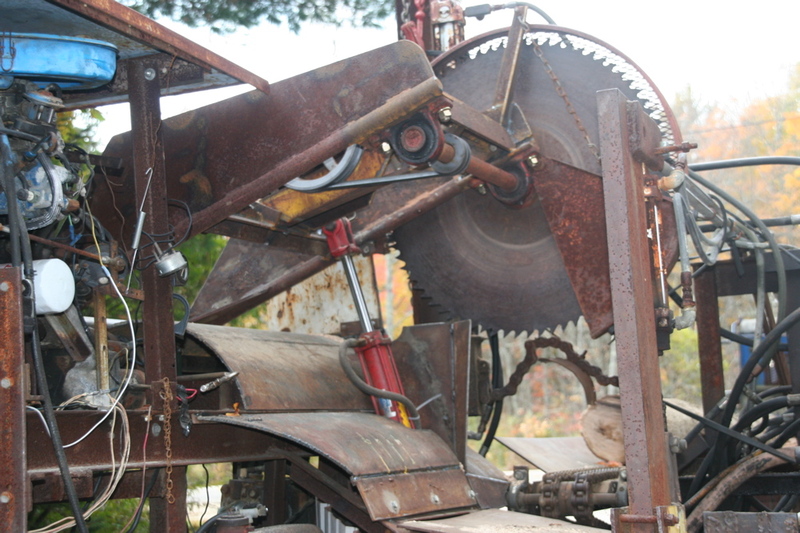 The saw and ram are now much better matched in turnover rate. I’m now slapping the control spool like Gretzky on a puck. Given the volume difference between the piston and rod size of the new ram, the motor (and fluid) is doing a lot of work on the return stroke. 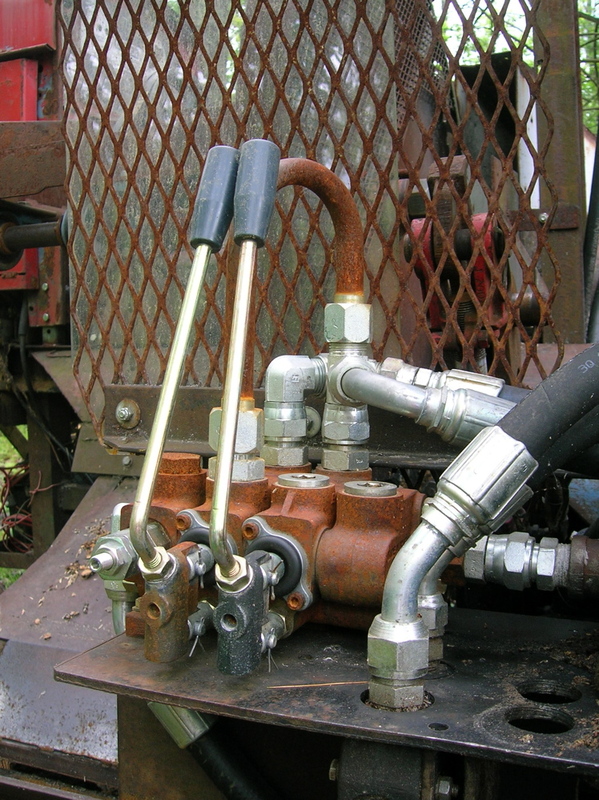 The pressure gauge indicates that pressure on the extend is nearly insignificant, while the retract registers more than 800psi. 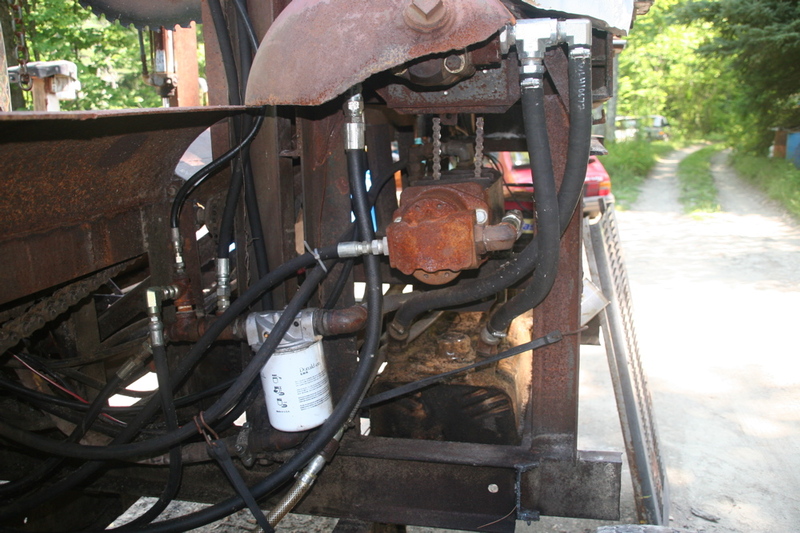 On the recommendation of the wizards at TST, I installed a piloted dump valve on the return. 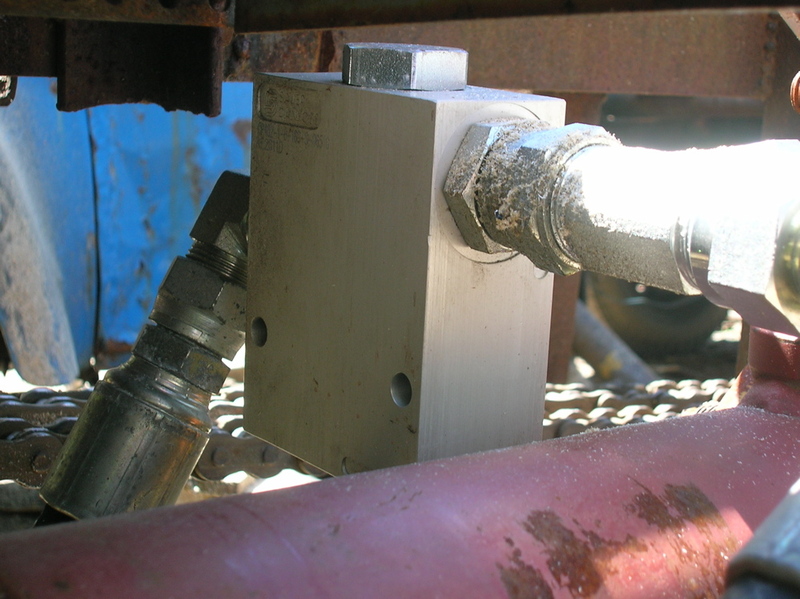 A pressure spike at this fitting at the start of the return stroke pops a valve inside the aluminum block in the previous photo. 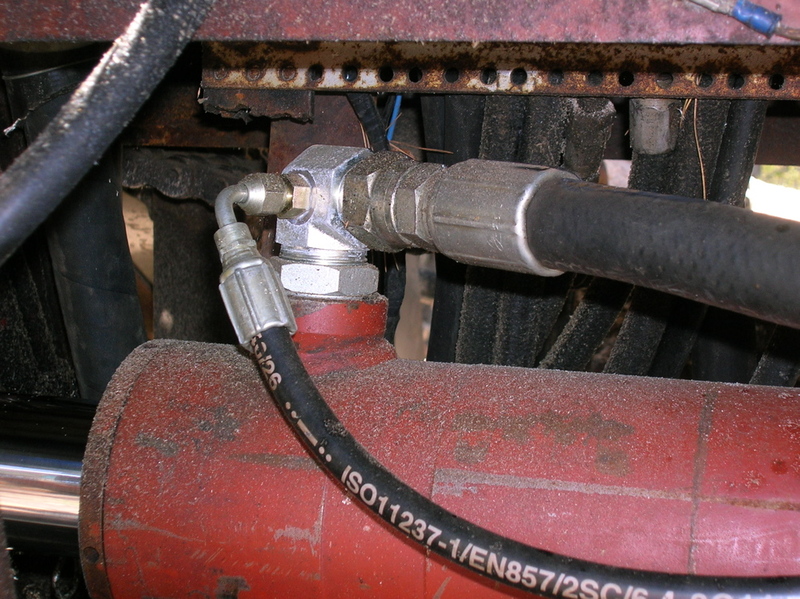 This routes return oil directly to the tank, through a large bore hose, rather than sending it back through the control valve itself, and then into the valve return. In other words, I’m no longer combining flow and trying to evacuate a greater volume in the same time frame. This dropped the pressure significantly. I should, over time, see a savings in fuel, and heat, while gaining ram speed on the return stroke. After much discussion in Merrimack, I bought an auto cycle valve. It needs about an 800-900 psi difference between the two stages. This particular unit is made by Danfoss. 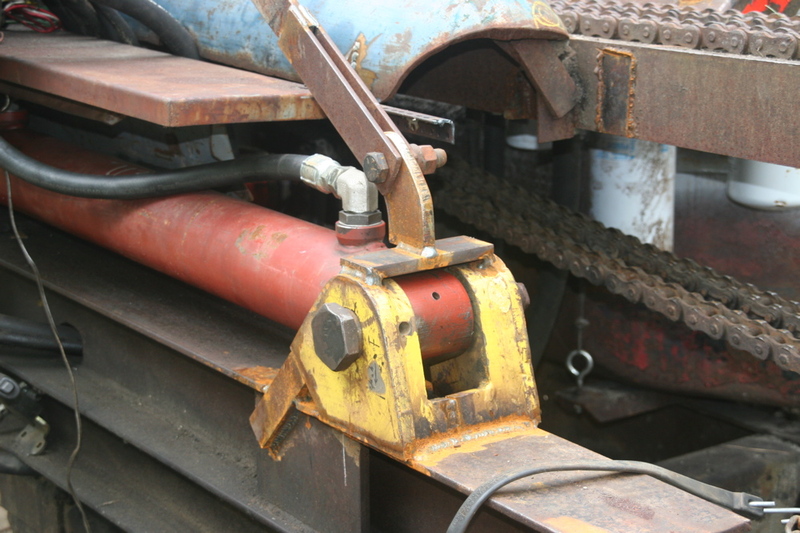 The ‘trombone’ loop obviates the usual hose run back to the rod end of the cylinder. 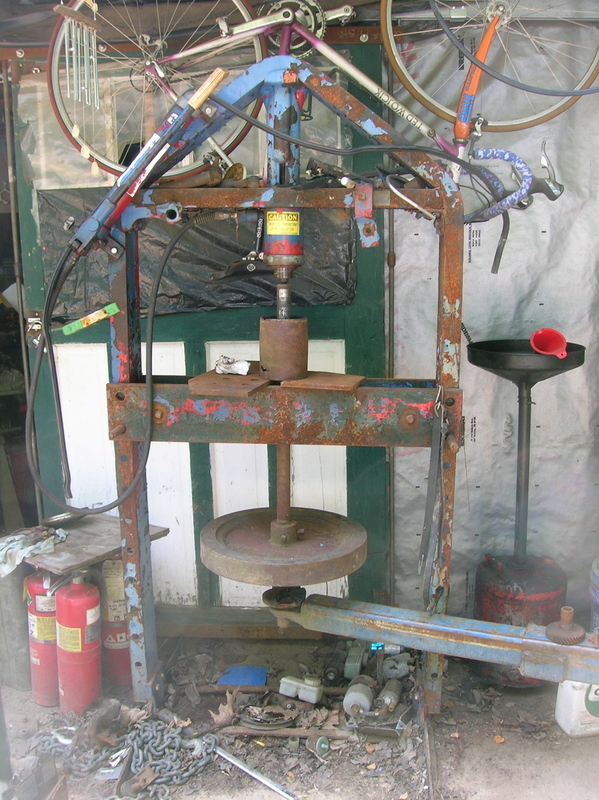 I opted to set the split detent for 1000 psi as a starting point, as I seldom saw 800psi with the previous ram. That might seem low, but the pusher seldom bounces at that pressure on a two way split, and then mostly when the oil is cold. I’ll pull the levers a second time, rather than break something using a higher detent setting. I bought a used oil cooler as surplus from a local lumber mill. It fits the framework like it was purpose built. A SAAB cooling fan. I have another from a Mercedes that should cool a little better. 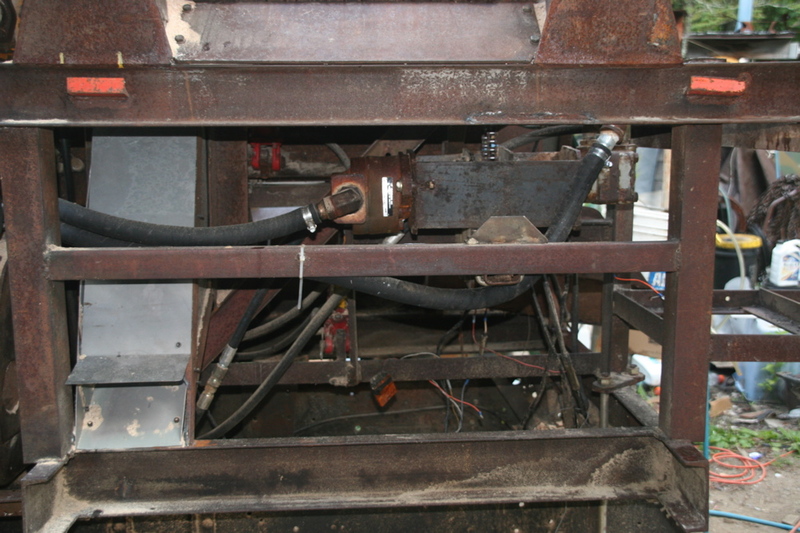 The cooler is plumbed into the saw return, as that circuit moves the most volume, and generates the most heat. 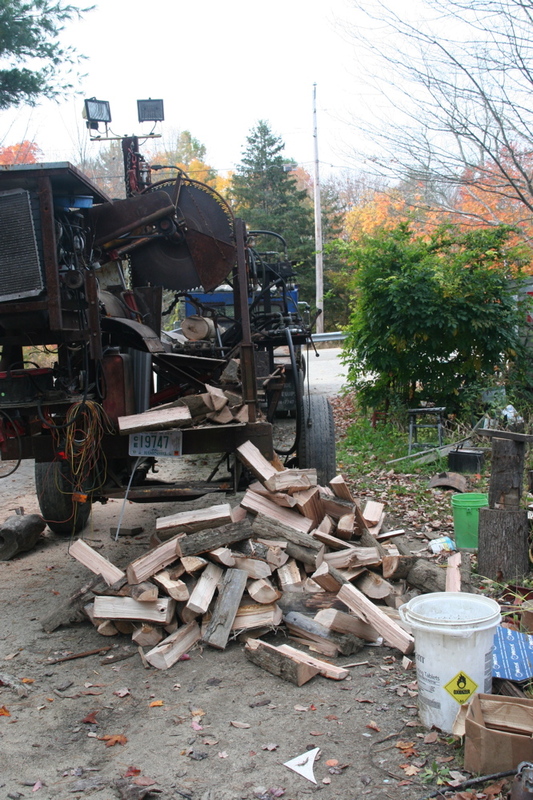 At present, I can produce around an honest cord/hour on about a gallon of diesel. 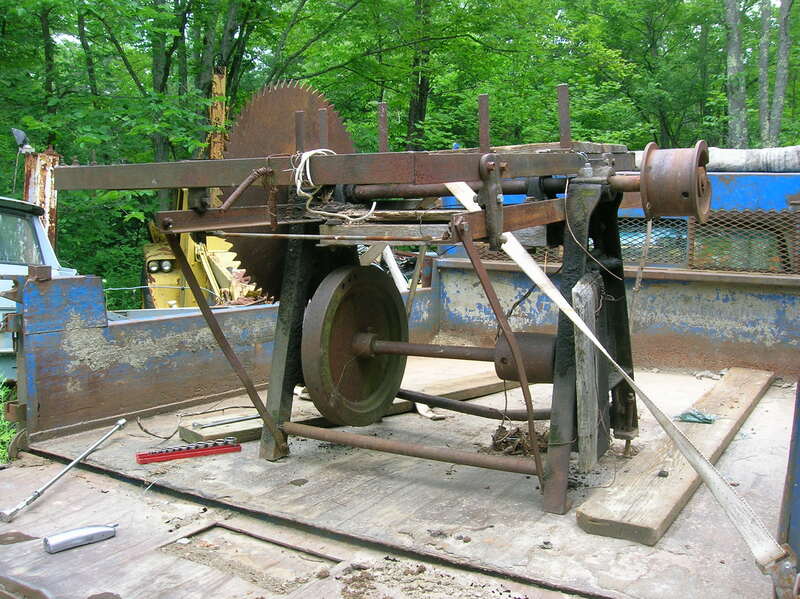 I aim to incorporate a flywheel into the saw drive on a belt driven jack shaft. This should reduce fuel consumption. 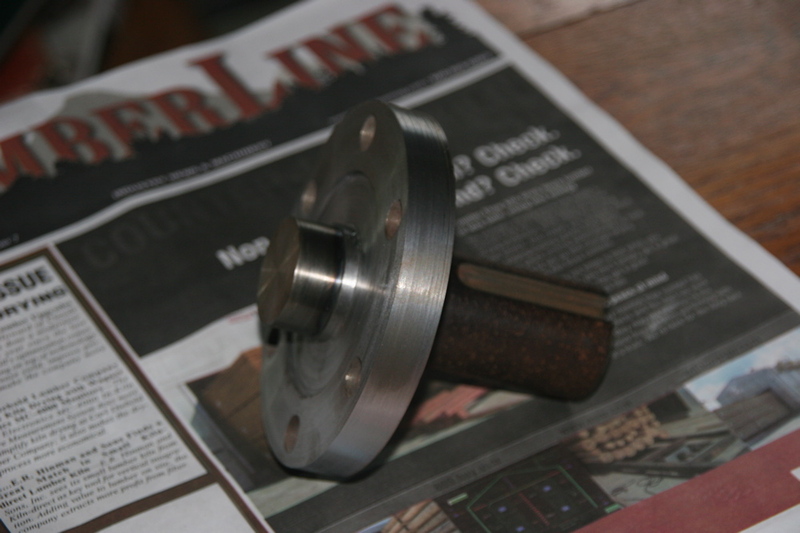 This flywheel will be used for ‘proof of concept’. 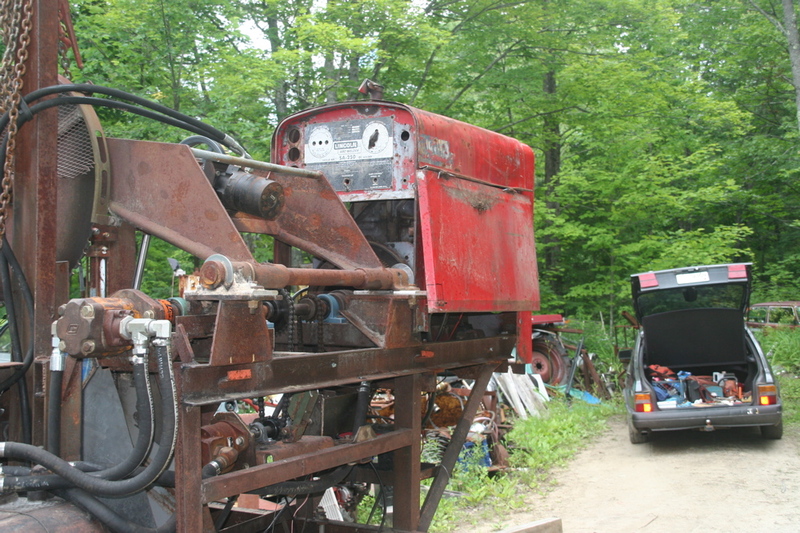 I have a larger unit from a Detroit 4-71, but this one is easier to mount up and test. 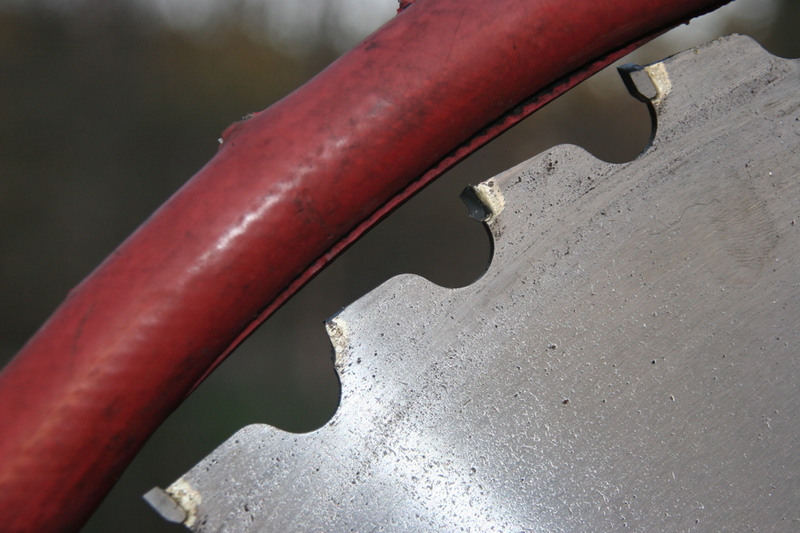 My hope is that by adding rotating mass to the blade/arbor, I won’t be trying to ‘push’ the saw teeth through the wood directly with the Bedford, but rather, the engine will be used to run up the flywheel, whose kinetic energy will be dissipated in the cut. This process should reduce fuel consumption, and further reduce sever time. 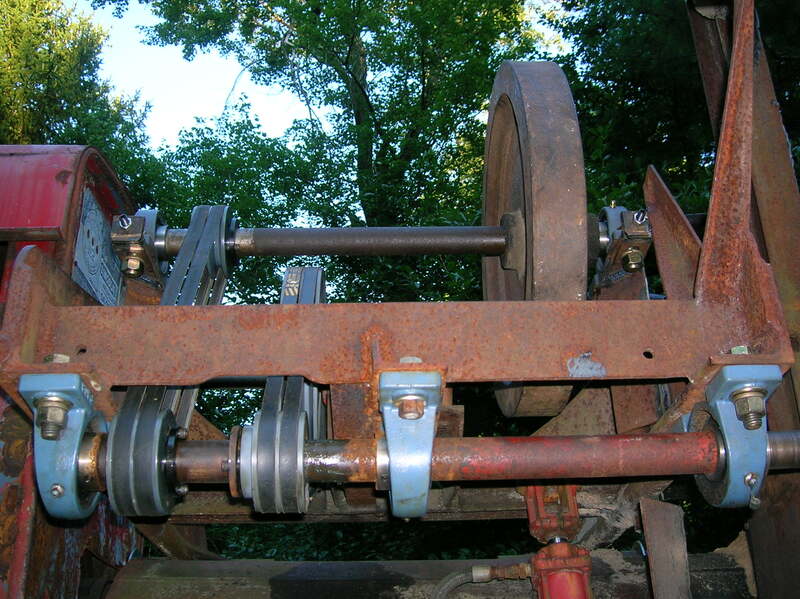 Removing the flywheel and sheave from the shaft. It is amazing how old rusty steel parts will come apart if you ask nicely. Speaks volumes on the topic of metallurgy. 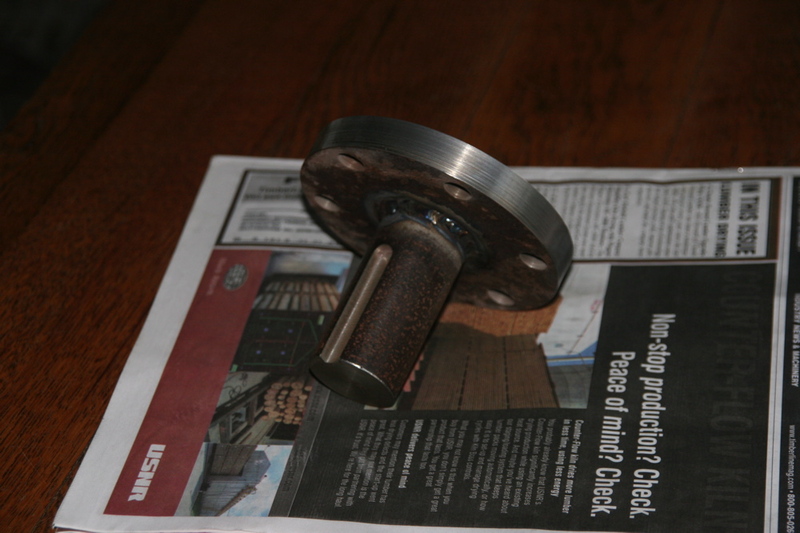 I’m using a snotty old piece of particle board and a few chunks of steel for the bearing mount mock-up. 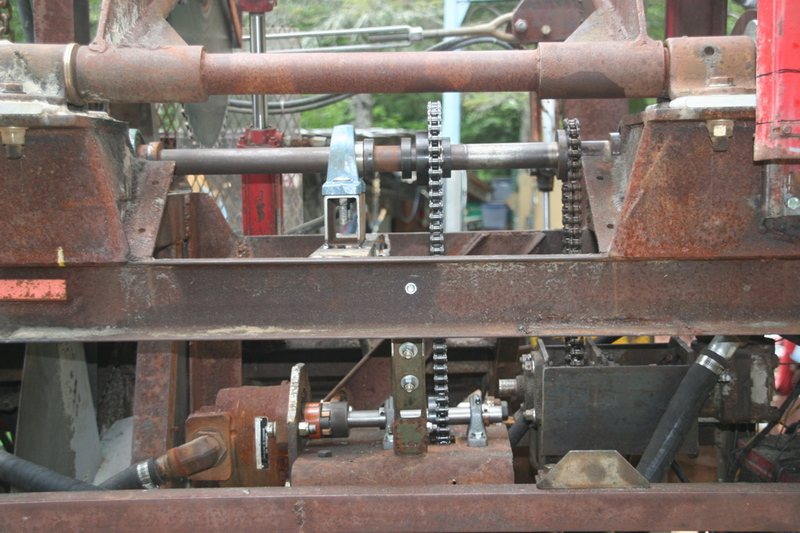 The arbor has to clear the gearbox sheave, the drive belts have to clear the cross brace, and the flywheel has to clear the cross brace, the gearbox, and another diagonal brace not visible in this picture. And I need to account for a standard belt length. Bearing brackets tacked. 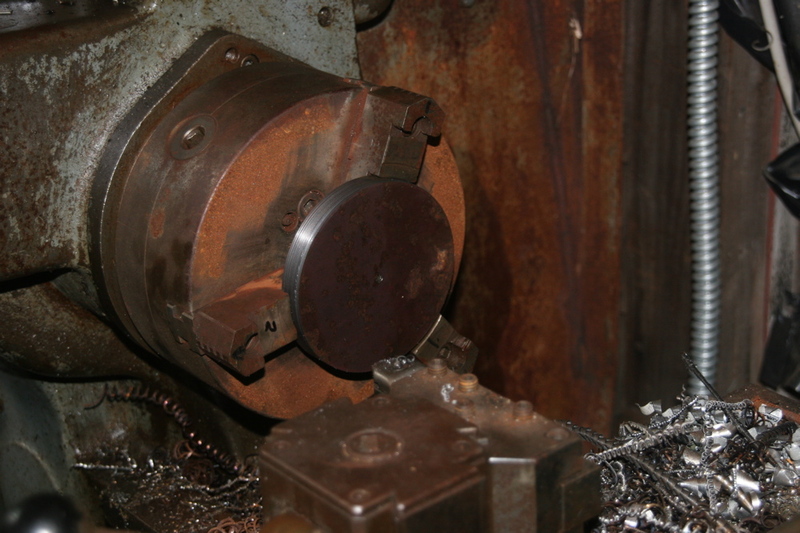 The small hole in the end tab is tapped for a setscrew, by which the bearings may be moved to affect belt tension. It will be interesting to see what effect the extra mass has on cut rate and fuel consumption. (video) Running with the flywheel. August 2012. 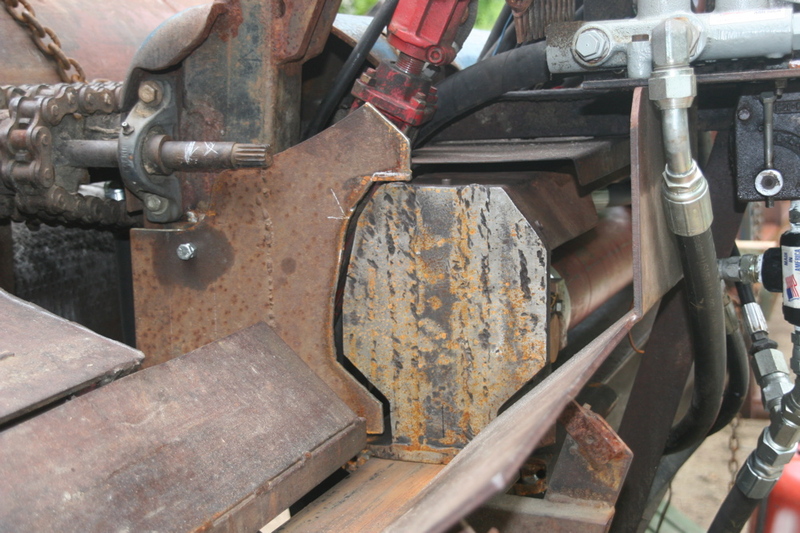 So far the flywheel seems to reduce time in the cut, as well as ‘throttle up’. However, there is a point where, if the saw slows too much, additional throttle is used to then bring the added mass up to speed. 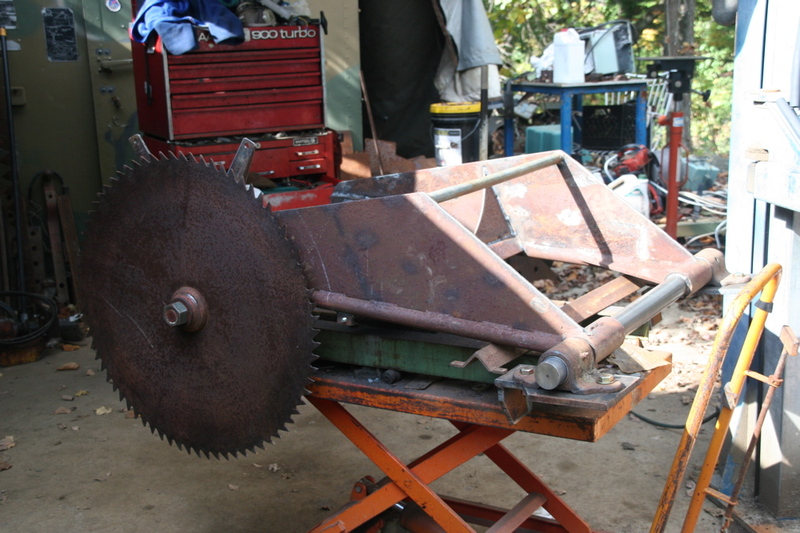 I think the next move will be the ‘plan B’ flywheel, left over from the sawmill refit engine project. I think it weighs at least 120 lbs, whereas this one is closer to 80. 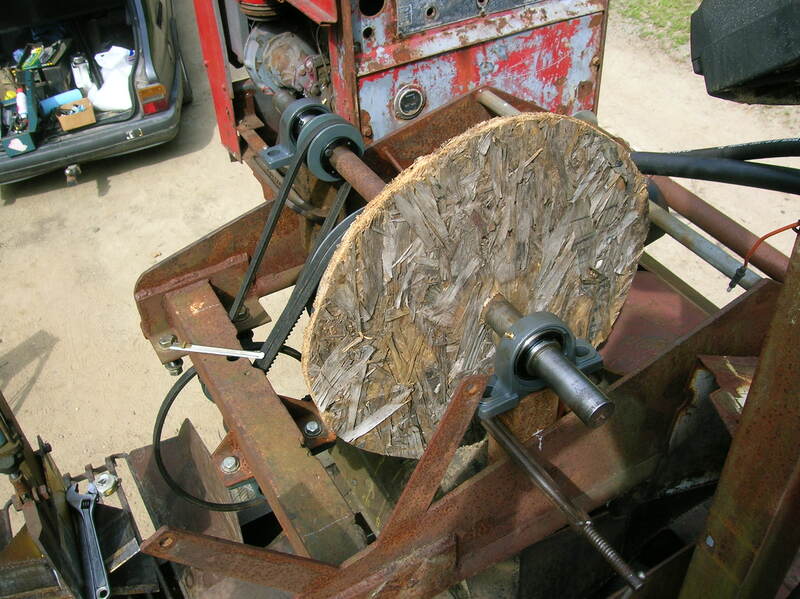 Also, towards the end of this particular job, the flywheel drive belts has settled in, and the loss of tension was noticeable on the larger diameter wood. I need to do some updates here. (some have been noted in ‘processor upgrades‘) I have since lowered the tooth count on the blade, replaced the saw drive motor with a bigger one more suited to the task, re-configured the auto cycle valve to engage with one lever rather than two, replaced the infeed drive motor with a better one that doesn’t leak and turns much faster, and added range to the vertical wedge travel. and probably one or two things that I don’t recall at present.